This scientifically peer-reviewed research paper is online available since December 21, 2009 (since 5 month), and is written by the authors George Cotsarelis and his colleague Chao-Chun Yang. This is the last research paper by Dr. George Cotsarelis (Follica) I’m aware of, and it explains (well written) the current research approaches behind Follica, AND it’s about exactly the same issues & topics, as mentioned/described in the PENN Medicine journal, as mentioned above. 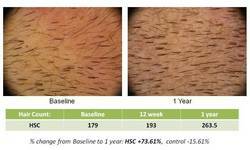 Dermal cells play a pivotal role in the regulation of hair growth. For hair follicle regeneration purposes, important issues include isolation of inductive dermal population, expanding their number by culture, maintenance of their hair inductive property and providing them an adequate niche and exogenous signals to enhance their interaction with epidermal cells toward the fate of hair neogenesis. An ideal hair regeneration model for human hair follicles has yet to be developed. The efficiency has to be improved with fewer starting cell number and higher number of regenerated hair follicles. The variables should be easily controllable for studying hair biology. The multipotent cells reside in dermal compartment of the hair follicle warrant further studies for their potential clinical application in regenerative medicine. yes, I am LMAO right now. You interpreted the research conducted by Cotsarelis and Chao-Chun Yang incorrectly. They are not talking about the Follica procedure. They are talking about multiplying hair inductive cells (DPs, DMs, etc) in culture and using assays to asses their effectiveness at restoring hair growth. This is the approach taken by Aderans and TrichoScience, not Follica. » approach taken by Aderans and TrichoScience, not Follica. Ahh, thanks! Now I know that they just studied and wrote everything for Aderans and TrichoScience - or ACell ? Well, per the references at the bottom of the research page, there isn’t anything recent from Stenn or McElwee… meaning that Aderans and Trichoscience haven’t published their findings yet. This paper by Cotsarelis is only based on publicly available information. Hopefully Aderans and Trichoscience have made some discoveries that Cotsarelis is not yet aware of (for instance, how to properly regulate the signaling environment afer cell re-insertion and how to multiply cells without compromising their hair inductive properties). Cotsarelis says in the paper that there is no method of making purely human hair follicles. That just doesn’t seem consistent with Aderans in Phase 2. If there was no way for human hair follicles to form, would Aderans have moved their procedure towards commercialization? Let’s just hope Aderans is one step ahead of Cotsarelis. » Trichoscience haven’t published their findings yet. » » Trichoscience haven’t published their findings yet. Iron Man there is one thing i will give you (and so should everyone on the forum) : You are a hell of a researcher! The presentation given by Dr. Stenn has nothing to do with the Aderans treatment. I read the abstract on the website and it’s about hair follicles forming in embryos. It’s not about hair multiplication. » forming in embryos. It’s not about hair multiplication. Hmm, but would this study make sense if Aderans studied similar approches like Histogen as well? BTW - this presentation by Dr. Kurt Stenn (Aderans) just shows, that Aderans studied each and every aspect (hair biology) of hair follicles during the past 8 years! Oh, I totally agree that it shows how meticulous Aderans seems to be. Just pointing out that the presentation isn’t directly related to their procedure. They are definitely studying the process of embryogenesis to enhance their understanding of hair multiplication. » understanding of hair multiplication. I hope Adreans come up with something, 8 years with a team is a long time to study. I wondering if Follica has completed any clinical trials on humans and if so do they have to acknowedge that to the public or can they have a private clinical trial. Because if they are using drugs already on the market they do not need to complete the 3 phases of a normal clincial trial… They acquired 15 million 2 years ago and mice are not that expensive to treat. They must be performing test on humans and paying them enough money to keeep their mouths shut. Billy – I am going from this statement by Cotsarelis himself (dated June 2009). Also, UPenn is conducting a trial right now aimed at PREVENTING hair growth… so… thanks, Follica. So what does this mean? Follica is crap? Or ARI is crap? I dont know cause its all the standard up and downs and i think everyone is sick of it.